Before reading this article, readers are advised to read the main article Arjuna's Military Campaign for Rajasua, that describes the entire journey of Arjuna for his military campaigns to the territories that lied to the north of Indraprastha. This article describes Arjuna's military campaigns in the territory of Bhagadatta. The regions covered by Arjuna, roughly falls in the Himachal_Pradesh state of India. Where as Jarasandha's empire extended along the Ganga river, the empire of Bhagadatta extended along the foothills of the Himalayas from Himachal_Pradesh) to Assam. Jarasandha's empire lied to the south of the four Vedic kingdoms viz. the Kuru-Panchala and Kosala-Videha where as Bhagadatta's empire lied to the north of these kingdoms. Jarasandha controlled the Uttarapatha trade-route that passed along river Ganga. Bhagadatta controlled the Uttarapatha trade-route that passed along the foothills of the Himalayas (approximately along the current India-Nepal boarder) as well as the trade route that passed through Himachal_Pradesh into Tibet close to the Sangla Valley along the river Satadru (Sutluj) . Both empires extended from east to west and can be otherwise called 'elongated territories' that controlled trade-routes. Numerous kingdoms that lied in the foothills of the Himalayas that can be located now in Himachal_Pradesh, Uttarakhand, Nepal, Bhutan, Assam, Meghalaya and Bangladesh lied within the great Himalayan empire of Bhagadatta. Since Bhagadatta's empire lied to the north of Indraprastha, conquering this territory was the responsibility of Arjuna who was to march his army in the northern direction. The tribes of Kiratas who lived in the foothills of Himalayas were under the power of Bhagadatta. The Kinnaras (Kinnaur, Himachal-Pradesh) who lived on Himalayas too were under Bhagadatta. A tribe of China too was allied to Bhagadatta. His army contained a large infantry composed of Kiratas and other mountaineers from Himachal Pradesh, Uttaranchal, Nepal and Bhutan. Bhagadatta also controlled the Yavanas (Indo-Greeks or Ionian Greeks) many Mlecha tribes who had their territories in the sea-shore (of Bay_Of_Bangal) along the mouth of Ganga and Brahmaputra. The Yavanas and Mlechas were engaged in sea-trade. Their goods passed through the trade-route along the Himalayan-foothills and was thus within Bhagadatta's empire. Yavanas had their settlement in Punjab also along the trade-route. The eastern regions (in and around Assam) of Bhagadatta's empire was rich in elephants. Bhagadatta trained them into war-elephants. Bhagadatta is mentioned as the foremost among the warriors skilled in fighting from the back of an elephant. He had the largest elephant army. Elephants were also found in other parts of Bhagadatta empire though Assam was the main source. In order to avoid mutual destruction, Bhagadatta had made peace with Jarasandha who ruled his own empire. Bhagadatta also made peace with Kuvera, the king of the Yakshas. Kuvera's Yaksha empire lied along the northern foothills of the Himalayas in southern Tibet, centered around lake [[[mbh:Manasa] (Manasarovara). The territories of the Rakshasas (Manali), Kinnaras (Kinnaur) and Kimpurushas in Himachal_Pradesh came under the power of the Yaksha king Kuvera. Beyond the territories of Yakshas towards its north and east were the territories of the Devas ruled by Indra. The extend of the Deva empire is unknown. However, it is mentioned in Mahabharata that, Bhagadatta had made peace with Indra also and was known as the friend of Indra. Pragjyotisha is mentioned as a city only once (Mbh.5.48) in Mahabharata. The name Pragjyotisha is applied to the whole of the territory controlled by Bhagadatta, which included the regions north to Indraprastha as well. As a result, confusion arose in the location of the city of Pragjyotisha. Gohati in Assam is usually considered to be the Pragjyotishapura or the city of Pragjyotisha. The location of the city can be in Himachal Pradesh as well. There is a village named Kamaru (Kamru) in Baspa Valley (Sangla Valley) of Kinnaur district of Himachal Pradesh. This is a candidate location of Pragjyotisha city. The name 'Kamaru' could be the remnant of the name 'Kamarupa' another name of Bhagadatta's territories. The name Kamarup is however not found in Mahabharata. This name is not used in Mahabharata to denote any territory of Bhagadatta. The name Kamaru or Kamru is also found in Tibet to the north of Bhutan as well. It is not clear if this territory belonged to the Chinas mentioned as allied to Bhagadatta. Mahabharata mentioned about a China territory close to Sindhu river in Tibet as well. Prag-jyotisha (Praag:- East; jyotisha: light, astronomy) means the eastern light. Hence it lied to the east, but probably from the point of view of the land of the five rivers (Punjab). Mahabharata also mentions another city or territory with similar name viz. Uttarayotisha (Uttara-jyotisha) meaning the northern light. Jyotisha also means astronomy. It is not clear if these cities has anything to do with astronomy or if Prag-jyotisha and Uttara-jyotisha had some relationship. Uttarayotisha is mentioned as part of Nakula's military expedition to the west. Arjuna went to Pragjyotisha with a message from king Yudhisthira. Yudhisthira wanted Bhagadatta to permit Arjuna to conduct military expeditions in the northern territories controlled by him and to collect tribute from the kings who ruled in these territories. Bhagadatta agreed to this considering the Pandavas as his allies since their father Pandu was his friend. Some verses in the chapters dealing with this encounter is lost in K.M. Ganguli's English translation. At Mbh.2.25, Bhagadatta tells to Arjuna:- O thou who hast Kunti for thy mother, as thou art to me, so is Yudhishthira also. I shall do all this. Tell me, what else I may do for thee. Mbh.2.26:- Thus addressed, Dhananjaya replied unto Bhagadatta, saying, If thou wilt give thy promise to do this, thou hast done all I desire. And having thus subjugated the king of Pragjyotisha, Dhananjaya, then marched towards the north, the direction presided over by the lord of treasures. Marching a large army up to Pragjyotisha in Assam is impractical though not impossible, especially when Arjuna has not yet subjugated the kingdoms through which he needed to march the army. Most likely, Arjuna went to Bhagadatta's city in Himachal Pradesh which was one of his toll-posts in the north-western part of his territory. Arjuna marched further into north after getting the consent of Bhagadatta. It is likely that Arjuna could not defeat Bhagadatta but only made him play neutral while he traveled through Bhagadatta's empire subjugating the kingdoms that lied within it. Some versions of Mahabharata, mentions that Arjuna defeated the Kulindas, the Kalakutas, the Avartas and the Sakaladvipas before reaching Pragjyotisha and he had a war with Bhagadatta, who was then forced to buy peace by giving tribute to Arjuna. Here it is mentioned that Arjuna traveled to the Kulinda region in the north compromising of Anarta (Avarta), Kalakuta, Kulinda-proper and Sumandala. From there he marched to Sakaladwipa and from there to Pragjyotisha. Kulinda is identified to be southern Himachal-Pradesh comprising of Shimla and Sirmur districts (See main article Kulindas). The identification of Sumandala is not yet accurate. The name Sumandala (Su:- good; mandala:- region) indicates that it was a good region, probably a plain with a river flowing through it. The Paonta Sahib region on the banks of Yamuna river fits the description. An alternate location of Sumandala, found around 25 km west of Paonta Sahib, named Suketi a village close to Nahan, the capital of Sirmur district. It lies on the banks of Markanda River, a tributary of Yamuna. Avarta (also mentioned as Anarta, not to be confused with the Anarta close to Dwaraka), in contrast of Sumandala, describes an opposite type of terrain. A-Varta means not a Varta ie not a place or not a well inhabited place. It could be the sparely populated hilly terrain to the north of Paonta Sahib which starkly contrast with the rich, beautiful and populated Sumandala (Paonta-Sahib). Kalakuta is identified to be Kalagarh in Garhwal, Uttarakhand. Kalakuta region comprised a grater region containing Kalagarh within it. It extended to the west and east of Kalakuta, containing the low lying southern most Himalayan mountains from where numerous small tributaries of Ganga, Yamuna, Satadru (Sutluj) and Vipasa (Beas) originated. Thus a portion of it lied in Kulinda too (in Sirmur District, Himachal Pradesh). Some consider Kalakot in Lohaghat, Uttaranchal too as part of Kalakuta. The word dwipa is to be understood here as region and not as island. Sakaladwipa is mentioned as one among the seven regions (dwipas) along with Jamvudwipa (Jammu region in Jammu-Kashmir). Sakaladwipa is identified to be the region between Chandrabhaga (Chenab_River and Iravati (Ravi_River) with the city of Sakala (Sialkote, Pakistan) as its center. There are regions named Sakadwipa and Sangaladwipa as well usually identified with Sakaladwipa. However Sakala was the capital of Madra kingdom ruled by Shalya who was an uncle of the Pandavas. Nakula, not Arjuna, was given responsibility to collect tribute from this kingdom. Nakula was to reach here as per his military campaigns to the west. Hence the Sakaladwipa mentioned in Arjuna's northern military campaign was elsewhere. One possibility is that this region is the modern day Sangla Valley in Kinnaur district of Himachal-Pradesh. The actual name of this region could be Sangaladwipa, distinct from the Sakaladwipa region of Punjab in Pakistan. The Pragjyotisha city where Arjuna met Bhagadatta in his military campaign could be in this Sangla Valley, close to the Satadru river, that flowed to its north. At Kamru in Sangla Valley there is a temple dedicated to Kamaksha Devi, the main deity of Pragjyotishapura (Gohati) in Assam. Kamru could be the site of Bhagadatta's original Pragjyotisha. The cultural traditions in this city might have transferred to Assam subsequently. This location of Pragjyotisha in Sangla explains how Bhagadatta could be present in the court of Kuvera, the Yaksha king, as a subordinate, as indicated in Mahabharata. Kuvera ruled at the city of Alaka close to Manasarovara in Tibet. 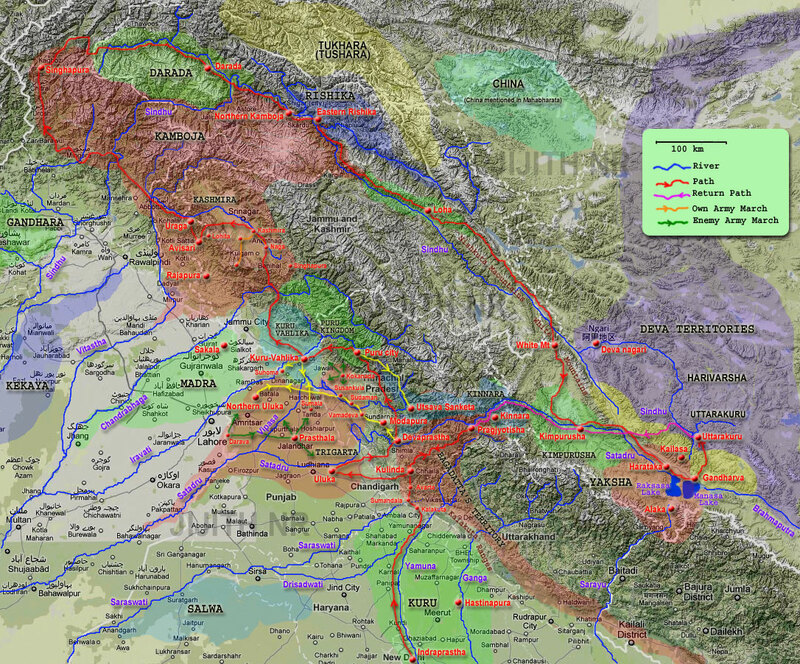 Kuvera's territory was accessible to Bhagadatta through the route along the Satadru (Sutluj) river. This also explains how the tribes of Kinnaras (who lived in Kinnaur district of Himachal Pradesh) could be under the rule of Bhagadatta. After meeting Bhagadatta, Arjuna's army might have swelled with a portion of Bhagadatta's war-elephants and horses which were useful in battles waged on hilly terrains. Mbh.2.26:- Arjuna then conquered the mountainous tracts and their outskirts, as also the hilly regions. Having conquered the kings that reigned there, he exacted tributes from all. Winning the affections of those kings and uniting himself with them, he next marched, against Vrihanta, the king of Uluka. Arjuna, after getting the support of Bhagadatta, then conquered the mountainous tracts and their outskirts, which lied in the Kulinda region (south-western Himachal Pradesh). These kings were allied to Bhagadatta and readily yielded to Arjuna due to the word of Bhagadatta and he got tribute from them all. It is mentioned that he won the affections of those kings. This indicate that the encounter was friendly.